The Korean manufacturer LG launched its medium budget tablet LG G Pad X 8.0 as part of the expansion of its LG X series in the first week of June 2016. However, there were reliable tweets by Evan Blass as early as April of the same year about the possibility of an upcoming tablet from the manufacturer. Almost everything mentioned in the tweets have proved to be true except for the release date that was speculated to be around mid May. While the affordable price tag is bound to set a happy note for tablet lovers, there are talks that this gadget bears a striking similarity to LG G Pad III 8.0 in many ways and thus lacks originality. 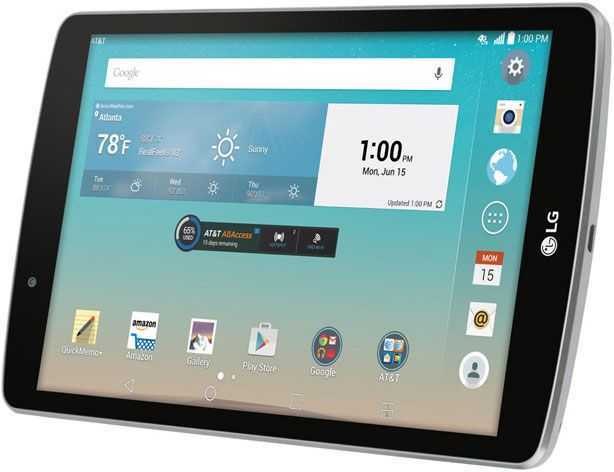 The LG tablet comes in a size of 210.8 x 124.2 x 7.9 mm. This makes the device really sleek although it can be too big to fit comfortably in your hand. You may also need both your hands to operate the G Pad X 8.0 with ease. Moreover, the tablet is also not very light on hand with a weight of 309g. This is irrespective of the fact that the gadget makes use of plastic as its body material. As for color options, LG has one choice each for metallic and non-metallic color lovers with gold and white colors to choose from. The back of the tablet has a textured finish for an assured grip. The LG G Pad X 8.0 houses an 8-inch screen as evident from its name which is large enough for activities like gaming, watching movies and reading. The screen also features an appropriate aspect ratio of 16:10. Additionally, the Full HD screen makes use of an IPS LCD display for wide viewing angles, and is made of Dragontail glass that makes it scratch resistant. The device renders sufficient clarity and sharpness with a pixel resolution and a pixel density of 1200 x 1920 and 283ppi respectively. However, the two main highlights of the screen are its reader and split screen mode. The Reader mode minimizes the intensity of the blue light emitted when it is nighttime to avoid hampering with your sleep. On the other hand, the split screen mode helps you to virtually split the screen of your tablet into two halves to help with multitasking. You can also receive your smartphone notifications on your tablet because of its Q Pair functionality. It may be interesting to note that the LG tablet sports the same 5MP camera on both its back and front. However, the primary snapper supports autofocus functionality while this feature is not present in the front snapper. The burst mode is one of the key features of the rear snapper. Its camcorder records 1080p (1920 x 1080) videos at 30 fps and supports video calling and sharing capabilities. Thanks to the secondary 5MP camera, selfies and video chats render decent results by appearing clear enough. The screen also acts as a selfie flash when you need in low lighting situations. The G Pad X 8.0 has some really good configuration for a smooth and seamless performance. The tablet has a 1.5GHz ticking octa core processor functioning as two quad core processors. Under the hood, the device also comes with a Qualcomm Snapdragon 615 chipset and an Adreno 405 graphics processor. Specs are not that bad on the memory front either. The gadget houses 2GB RAM and 16GB ROM as internal storage. This 16GB can be further expanded up to 128GB. With the latest Android 6.0 Marshmallow being preinstalled, things get a whole lot easier. Moreover, this can be customized with the manufacturer’s own user interface to give you additional features. Most of these features can turn out to be quite handy and useful. The slate supports all standard connectivity options that include Wi-Fi (both direct and hotspot), Bluetooth v4.2, GPS and microUSB v2.0. Apart from the micro USB connection, there is also a full USB slot in the handset. This allows you to insert the standard USB stick into the port and access its contents as usual using a file manager. LG makes use of a non-removable 4,650 mAh battery for its LG G Pad X 8.0. This battery offers close to 20 days of standby. The LG g pad x is the same as the lg g pad iii 8.0 the only differences is that the x has a 8MPX camera and the iii has a 5MPX camera and the x is exclusive to the USA vs the iii being exclusive to Canada and Korea. On a side note the processor is actually the snapdragon 617 not the 615, just as a heads up.